Cajal, which are stem cells similar to the pacemaker cells of the bowel wall. They are characterized by expression of a tyrosine kinase growth factor receptor, KIT (CD117). The pathologic criteria for malignancy in both smooth muscle cell tumors and GISTs are somewhat arbitrary. They depend upon averaging the number of mi-totic figures in multiple high power microscopic fields and assessing cellularity and pleomorphism [10, 11]. The tumors tend to grow slowly. 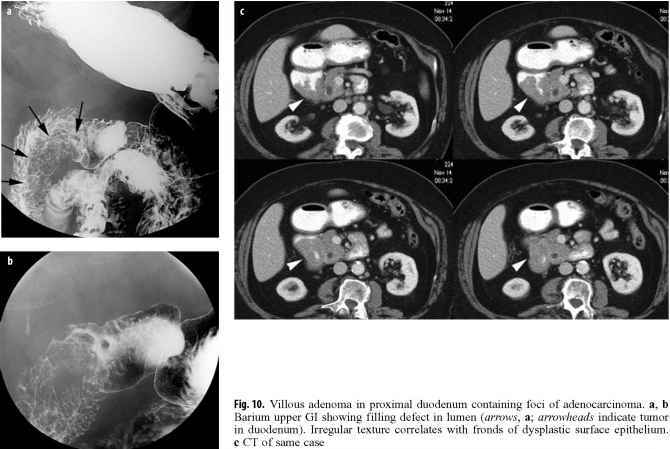 Although often small and difficult to detect, occasionally such tumors may become huge. Malignancy in stromal tumors correlates well with size, except in the esophagus where the vast majority are benign, even when very large. Stromal tumors tend to grow as firm, rubbery, rounded masses of compact intertwined bundles of spindle cells. 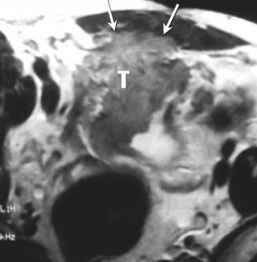 The tumors have no true capsules but are usually easily shelled out from surrounding compressed tissue. Their roentgen appearance depends upon their site of origin, size and direction of growth. Tumors arising in the outer layers of the wall tend to grow outward into the surrounding tissue. If small, they cause no symptoms and the majority are probably never detected. When larger, they may appear as extrinsic masses. Lesions arising on the inner aspect of the muscle wall or muscularis mucosae more easily displace the pliable submucosa and mucosa than the firmer muscle wall. Thus they grow toward the lumen and tend to cause symptoms relatively early. Ordinarily the epithelium is stretched smoothly over such submucosal masses, often with obtuse angles at the periphery. If such lesions become large enough, however, they may protrude into the lumen and develop short pedicles. In that case the mucosa will be tucked around the lesion with acute angles at the borders, a limitation of the so-called 'sulcus sign' sometimes used to distinguish mucosal from submucosal or extrinsic lesions. While the covering mucosa is initially intact, the protruding submucosal mass exposes it to trauma from luminal contents and may compromise its blood supply. Superficial ulceration, thus, is an expected complication of any such lesion and may be its mode of presentation. Vascularity within GISTs and smooth muscle lesions is variable, often being rather sparse. Frequently, however, there are prominent arteries in the superficial layers of such tumors and these can be the source of sudden, dramatic hemorrhage when eroded by ulcers. Such behavior is well known with gastric GISTs where the luminal acid is ulcerogenic and where the lesions can become larger without luminal compromise. GISTs are usually solitary, but may also be multiple in a small number of cases. 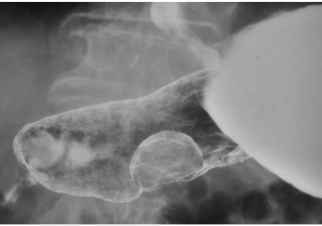 Calcification is rare in GI tract leiomyomas, as opposed to the situation in the uterus. When it occasionally occurs, it can be a useful radiographic clue to the diagnosis.